February 20, 2014 --- Enclosure specialist Intertec is supplying high performance environmental protection cabinets for Shell’s ‘Prelude’ floating liquefied natural gas project. Designed specifically for extended service life in hazardous areas, the shelters incorporate innovative semi-passive cooling technology and are some of the most stringently specified instrumentation protection solutions that Intertec has ever produced. Shell’s Prelude floating liquefied natural gas (FLNG) project is setting new engineering records. Designed to liquefy natural gas extracted from subsea wells by chilling it to -162 degrees Celsius, and to then store the liquid until it is offloaded to large LNG carriers, the vessel will be the largest in the world, with a length of 488 metres and a width of 74 metres. The hull of the vessel was constructed in South Korea and launched in December 2013. Due to enter service in 2017, the vessel will be towed to the Prelude and Concerto gas fields in the Browse Basin near Timor, about 200 km off the northwest coast of Australia, where it will be permanently anchored for about 25 years. After this time it will be inspected, overhauled and possibly moved to a new location, where it will be expected to provide a further 25 years of service. Much of the on-line process analysis instrumentation on the Prelude FLNG vessel will be housed in purpose-built environmental protection cabinets supplied by Intertec. In total, the company is supplying 90 cabinets for sample conditioning systems and 30 cabinets for process analyzers, each designed to match the instrumentation content and layout precisely in order to optimise thermal performance. The cabinets that Intertec is supplying are required to be capable of withstanding severe Category 5 tropical cyclones with wind speeds in excess of 252 km/h (157 mph) and to have a minimum service life of 25 years - with 50 years as a design aim. Additional requirements include a high degree of resistance to corrosion being caused by the saline environment and the presence of sour or acid gas, and the ability to cool electronics equipment without using explosion-proof air conditioning systems, which incur high capital and operating costs. 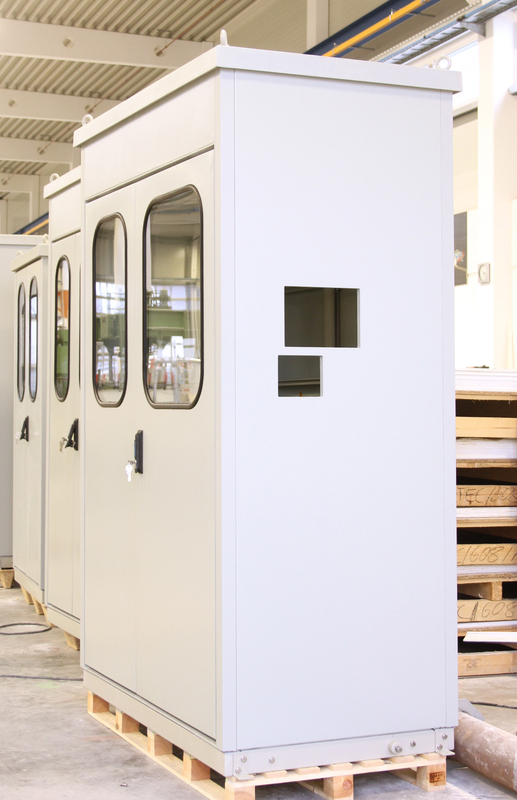 Intertec’s environmental protection cabinets are constructed from a proprietary composite material comprising sandwich walls of long-fibre glass reinforced polyester (GRP) sheets, enclosing a core of polyurethane foam. The material has a similar strength to that of stainless steel but is about four times lighter, making it ideal for use on offshore platforms and floating structures, where every effort is made to minimise weight. Other advantages include a very low thermal conductivity which facilitates the construction of efficient, condensation-free cooling cabinets, and an inherently high resistance to corrosion caused by salt or aggressive chemicals such as sulphur or chlorine. For this project, the external surfaces of the cabinets are further protected by a thick layer of UV-resistant gel coat. 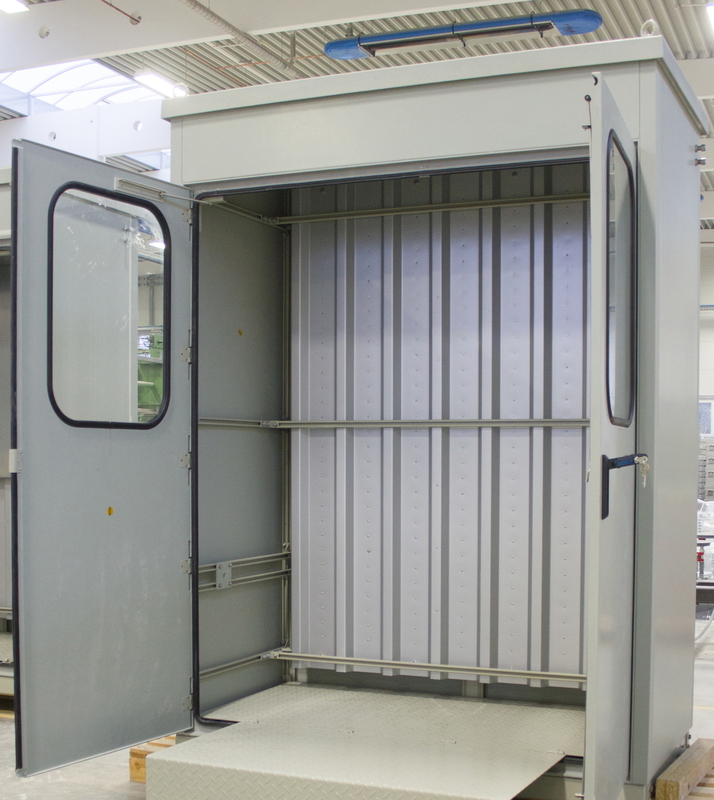 In order to meet the application’s high wind speed requirements, each cabinet is equipped with special built-in mountings – which are external to the thermally insulated parts of the enclosure – to secure the top and base to Prelude’s deck structure. All external metal components are fabricated from 316 stainless steel with a corrosion-resistant protective coating that is specified for ship use. Each of the 120 Intertec cabinets incorporates a unique form of semi-passive cooling technology. The internal face of the cabinets' rear walls are fitted with a high efficiency heat exchanger, comprising one or more aluminium cooling plates and stainless steel coolant pipes connected to Prelude’s cold water supply system, which obtains ‘cold’ water from the deep sea by a 150 m long pipe below the vessel. Heat dissipated by the equipment in the cabinets is absorbed by the water and transferred to the vessel’s main water cooling system, where it is dissipated to the environment. The size of each cabinet depends on the power dissipation of the contained sample conditioning or process analyzer system, which ranges from 140 W to 900 W.
This form of distributed cooling has enormous technical and economic advantages, especially in hazardous areas or where space and weight is at a premium. It provides a very efficient means of removing heat from the cabinets without requiring local air conditioning systems, which would necessarily need to be explosion proof – and therefore expensive. Furthermore, transferring heat from individual air conditioners of below-deck cabinet installations to the ambient environment would be a major challenge and involve significant amounts of space-consuming air ducting. The semi-passive cooling system is inherently safe for use in a hazardous environment; at the cabinet level it requires little or no electrical power of its own and is virtually maintenance-free, making it ideal for long life-cycle applications. Intertec -Hess GmbH, Raffineriestr. 8, D 93333 Neustadt, Germany. Intertec -Instrumentation BV, Postbus 235, NL-6600 AE Wijchen, The Netherlands. Custom instrumentation protection cabinets that Intertec is producing for Shell’s Prelude FLNG project are designed to withstand Category 5 cyclones. Semi-passive cooling technology is fitted into each instrumentation protection cabinet that Intertec has produced for Shell’s Prelude FLNG project - avoiding the need for expensive and large explosion-proof air conditioning equipment.